A new Citroen I actually like! – HubNut – celebrating the average! A new Citroen I actually like! Yes, I’m surprised too. Since the demise of the XM and Xantia, I’m not sure there has been a Citroen that I actually want to own. Nice as a C6 is, they’re a bit – needy. And huge. And scary. The Citroen I would really like to own is not huge. It’s not really a Citroen at all – it’s a Mitsubishi. But hold on a minute. What actually is a Citroen these days? 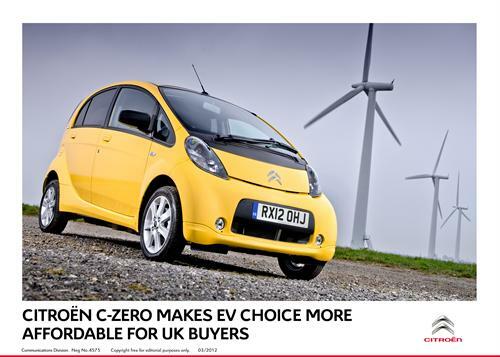 The C1 is a Toyota while everything else is just rehashed Peugeot. Hydropneumatic suspension is dead and the entire range is one big pile of Meh. The Cactus looks a bit interesting, and has a nice interior, but I wouldn’t rate it as desirable. The C-Zero on the other hand, that really does appeal. For a start, it’s based on a Japanese Kei-car – built to strict regulations on size and speed. My Perodua Nippa began life as Kei-Car (though it’s 847cc is over the 660cc limit). I’ve always loved Kei cars and the skinny, high-up looks of the C-Zero put me in mind of the 2CV. Best of all, the C-Zero is electric, so EV kicks ahoy! One of the first electric cars in fact, with the Mitsubishi i-MIEV on which it is based launched in 2009. It seems to be a fairly good one as well – I’ve spent a lot of time looking into this. Now sure, it’s no Nissan LEAF – it’s far smaller for a start and a lot lighter – a good few hundred KG. That makes a difference. While it’s range is firmly in the 60-80 mile range, that’s pretty similar to an early LEAF. It’s an entirely useful amount of range, just not for every journey you’ll ever do. I reckon it’d cover about 90% of my journeys. The range isn’t brilliant, but that’s because the battery is a lot smaller than a LEAF. It has to be, the car is much smaller. The major benefit here is that charging time is reduced – seven hours from pretty empty to full compared with ten hours for a LEAF. Appealing. But the good news doesn’t end there. Citroen (and Peugeot with the identical iON) actually suspended their agreement with Mitsubishi while they tried to sell existing stock. I think that must be complete now and with the agreement rumoured to cover 100,000 vehicles (split between Peugeot and Citroen), they seem keen to make a real crack of it again – the price has dropped to a remarkable £11,995 on the road (including government grant). That’s astonishing! These cars were £28,000 or more when they first hit the market. You’re probably wondering what a C-Zero is like to drive though. So am I. Frustratingly, I’ve been utterly unable to get my hands on an i-MIEV, C-Zero or iON so I’ve no idea. None of the manufacturers seems to have one on the press fleet and dealers have been less than sympathetic. And often bloomin’ miles away too! Needless to say, if you do own one and don’t mind a strange chap with a beard having a drive, do let me know! ex 2CV owner here – I have owned my Peugeot iOn for over 2 years now and love it. If you’re ever down this way (Newquay, Cornwall) you’d be welcome to have a go in it. Thanks! Not often down that way but glad to hear you like the iON.